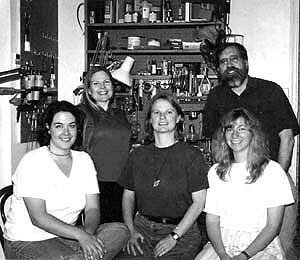 Flute students are often interested in aspects flute repair and flute making and I have long offered brief, introductory-classes, similar to those I taught at Wildacres back in the 80’s. Shortly after my coming to Western Carolina, the graduate flute students campaigned for something more "professional.". I began an “Advanced Repair” class which quickly acquired a life of its own. The group on the left are the original instigators. From left to right: Valerie Rice (started with Powell. then moved to Burkhart-Phelan), Rita Hayes (Asheville Symphony, Brevard College, and a large private studio). Rita is probably best known as the lead singer and flutist with Braidstream. Libby Eglinton is back in Wellington, NZ, subbing with the New Zealand Symphony and practicing physiotherapy (fixing more flutists than flutes) and Joy Foyer Sears (first with Straubinger flutes and more recently JL Smith) is in business for herself. Another and more recent graduate is Reuben Councill, who now has his own shop in Selinsburg, PA.. Our most recent graduate is Jessica Squeglia, who recently began training at Brannen Brothers. In spite of our students' obvious professional success, I have never considered this a vocational training course! I do consider it an adjunct to good playing. It provides a better understanding of how the flute works and an alternate income while waiting for that orchestral position. The degree offered is an MM in Flute Performance.